The 1909 Buckingham Murders: Part IX | slate river ramblings . . . . Following the request for a change of venue for the trial of Dallas Wright, fifteen men of Buckingham County were interviewed by the attorneys. 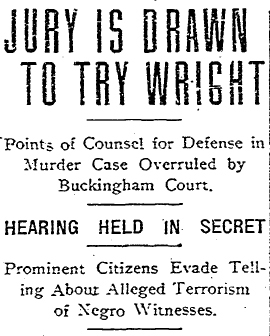 They were questioned separately and all gave their opinion that Wright could receive a fair and impartial trial in Buckingham County. When asked for the names of these men the witnesses refused to give them, though warned by the court that if they refused they were liable to be punished for contempt. Persisting in this refusal, they were taken in charge by the sheriff. One of the number who refused information said if he gave names he would tend to incriminate himself, and the court, recognizing his right under the Constitution, excused him, and finally the other witnesses who availed themselves of their constitutional privilege gave the same answer. . . . Some of these men are said to be prominent, and desired an examination behind closed doors. The article went on to say that John L. Lee, counsel for the defense, was “quite severe” in his cross-examination of some of the men who may have been involved in the intimidation of Richard Perkins. Humans are endlessly inventive in devising torture methods. Perkins’ ordeal reminded me of waterboarding. I had forgotten about waterboarding. Richard Perkins was one strong guy. I sure wish I knew more about him leading up to the event. More coming in the next post.